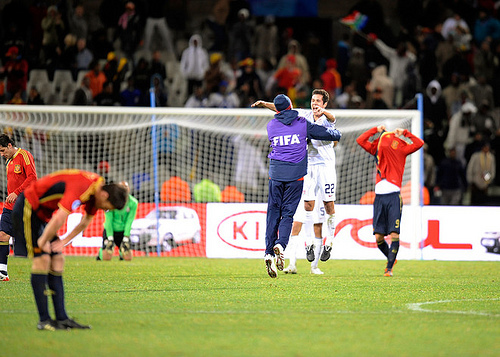 Will Spain's fortunes in the World Cup be similar to Euro 2008 or the 2009 FIFA Confederations Cup? On Tuesday, the goalkeepers and defenders were discussed, and Wednesday, the midfielders were discussed. With all of the creative talent in the midfield, that will bring the pressure on the forwards to convert the multitudes of chances that Xavi, Xabi Alonso, etc. will create for them. Obviously, the two starting men up front would be David Villa and Fernando Torres, but Torres currently faces an uphill battle to be fit enough for their first World Cup game on June 16 against Switzerland because he is still recovering from knee surgery in April that cost him the rest of the Premier League season. Thus, the reserve forwards will have a significant role to play, and while those two spots are not secure, Fernando Llorente of Athletic Bilbao has the third-choice forward in his hands. Included in the 2009 FIFA Confederations Cup squad, he epitomizes the target-man center forward with his height and strength. His technical skill should not be overlooked either, and with fourteen goals in La Liga and eight goals in the Europa League this season, only injury or a disastrous training camp will prevent him from making the squad. Álvaro Negredo endured an inconsistent season with Sevilla, failing to impress enough to dislodge either Luís Fabiano or Frédéric Kanouté up front. Because both could not continually stay fit, Manolo Jiménez and Antonio Álvarez gave Negredo numerous chances to prove himself. His occasional run-ins with the Sevilla technical staff did nothing to paint himself in a more positive light, but when he played for the national team in his four appearances, he belonged. His two goals against Bosnia and Herzegovina certainly showed his potential, but if Vicente del Bosque will finalize the last few spots based on current form, Negredo will have plenty of work to do in the last week of the La Liga season, the Copa del Rey final against Atlético Madrid, and the training camp to convince del Bosque that he deserves a seat on the plane to South Africa. Dani Güiza has been the third forward since late 2007 for the Spanish national team, and his two goals in Euro 2008, including the match-winner against previous European champions Greece, showed that he could shine in the limelight of international football. He made a newsworthy transfer in the summer of 2008 when he moved to Fenerbahçe for €17.4 million after winning the Pichichi with Mallorca in the previous season, and while he has had moderate success with the Istanbul club, he has not lived up to that transfer fee. This season, he scored eleven goals in the Turkish Süper Lig but did not score in any of Fenerbahçe’s Europa League matches once they qualified for the group stage. Llorente, Negredo, and Güiza are similar strikers in style, so Vicente del Bosque will have to decide among the proven international Güiza, the in-form Llorente, and the mercurial but talented Negredo. That leaves the wild card in this discussion, Pedro Rodríguez. A talented player from the La Masia youth academy of FC Barcelona, his original role on this year’s Barcelona squad was to be a backup to Lionel Messi and Thierry Henry, but as Henry slogged through a dip in form, Pedro unexpectedly rose in prominence, and he became the first player to score in six different competitions in one calendar. Firmly entrenched in the three-pronged attack for Barcelona, he does not just score the meaningless goals when Barcelona is up two or three goals. In the Champions League, Copa del Rey, and important La Liga matches, he scored numerous times that either tied the match, gave Barça the lead, or provided that two-goal cushion to ease the nerves. Uncapped at the international level, that might be a knock to most players, but with his revelation of a season combined with a skill set that is completely different from the other strikers contending for the reserve forward spots, Pedro has a better than a fifty percent chance to join some of his Barcelona teammates in South Africa. Whatever decisions Vicente del Bosque makes for his final 23-man squad, the wealth of talent from which he has an honor to choose is unparalleled in international football. As detailed in Spanish national team history, they have always had supreme skill yet folded in the biggest moments. With their Euro 2008 success, this team might have exorcised those demons, but now they are co-favorites with Brazil to win World Cup 2010, and anything less than a finals appearance will be a bitter disappointment.